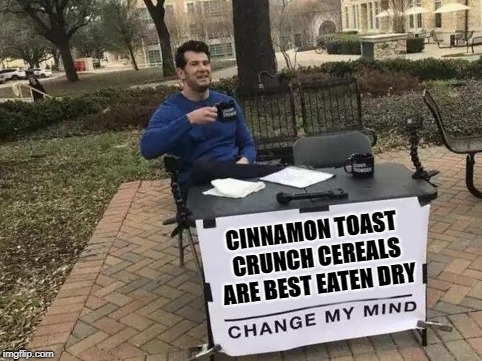 I'm a dry-cereal advocate, but only for certain brands/lines. Take Cinnamon Toast Crunch for example. When in milk, all the granulated sugar and flavor-dust washes away to create a coveted cereal milk concoction mimicked by fancy foodies, but to get to it, you need to power through a lackluster soggy cereal situation. 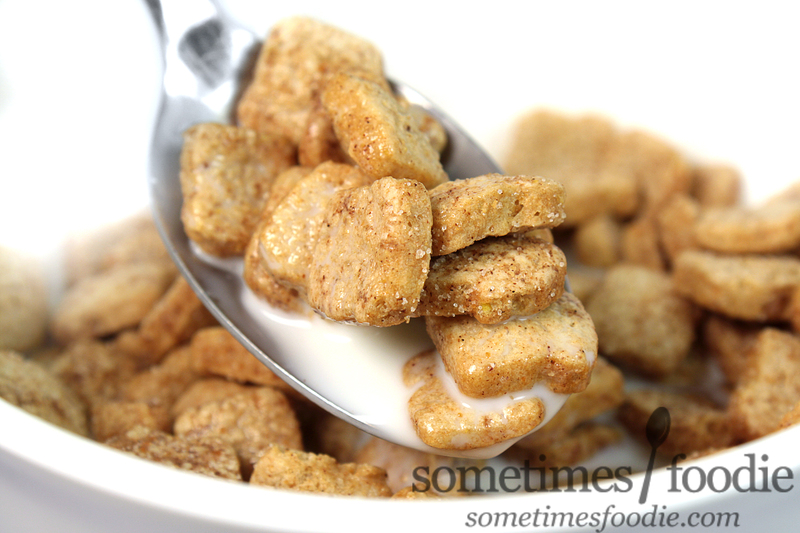 Now, I can appreciate some delicious cinnamon-infused cereal milk, but have you ever tried...just eating the cereal? I am now a 30+ year old future corpse adult, and I eat Ziploc baggies of dry cereal at work, and it's amazing. 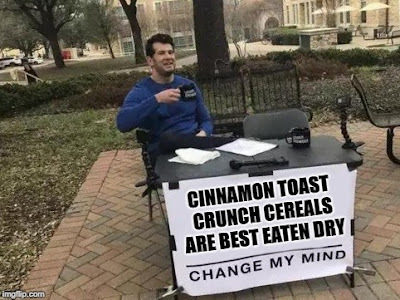 So far I have found the dry cereal rule to be true for both classic Cinnamon Toast Crunch, and Sugar Cookie Toast Crunch, but what about Apple? Will this cereal will be the exception to the rule? The times they are a-changin'. Look at this box! It's covered in bright colors and wacky illustrations. Goodbye white box and goodbye (sort of creepy) baker-mascot, Chef Wendell. 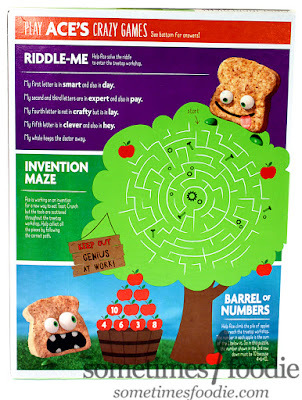 In his place, we have kooky cannibalistic cereal pieces with googley eyes. I think some people like to hate on these little guys, but you know what? They're growing on me. (Like Gritty.) Although I am happy they were contained to the back of the box. Overall, it's a simple design, that catches the eye, and the color scheme (on the front of the box) mimics other apple-y cereals so it feels familiar, even though it's "new." 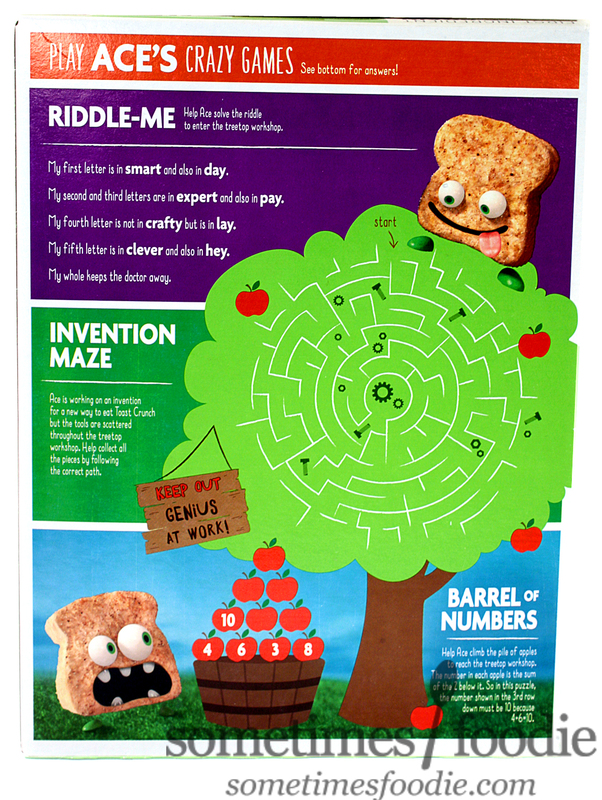 While the back has some fun games and bright colors to stimulate your brain (a little) while you mindlessly munch away in the morning. It's not going to end up in the cereal box hall of fame, which is a thing?, but looking at it makes me happy, so it's an overall-success. When opened, the cereal looks just like the box-images promised. We have tiny little toast-shaped pieces, similar to French Toast Crunch (a 90's kid staple), only this time they aren't an unnatural yellow-color. these look beige, and cereal-y, with a cinnamon sugar coating, and they smell like...actual baked goods. Yes, please! Honestly, the scent is just fantastic, like apple crumb cake. I knew this was going to be good, but could it surpass the original? I grabbed a handful for the as-is taste test. Right to the point: this stuff is delicious. Take all the fruity flavoring of Apple Jacks, or Apple Cinnamon Cheerios, and add the delicious sugary flavor-dust from Cinnamon Toast Crunch. 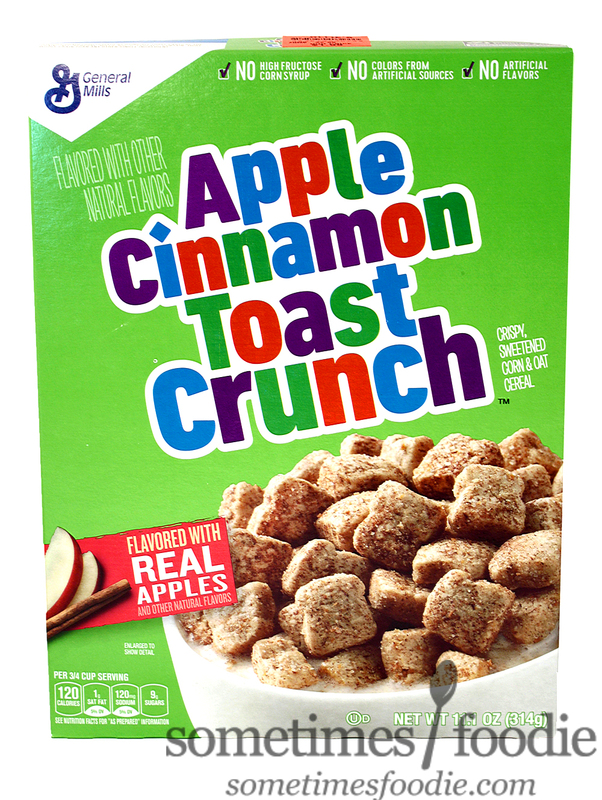 Apple got top-billing for a reason, it is rather bold and overpowers the more cinnamon-y aspects of this cereal, and the fruity flavoring lingers for a while after the cereal is chewed and gone, but I don't see that as a negative. As a dry cereal snack, it doesn't get much better than this. I may prefer this to the original! (Blasphemy!) But...what about adding milk? Thanks to the more substantial toast-shaped pieces, instead of thin cereal shingles, these hold up a lot better in milk and they do retain more of their flavoring than you'd expect, but this flavor has the fame fatal flaw as all the other Toast Crunch cereals, all the flavoring, is in the coating. 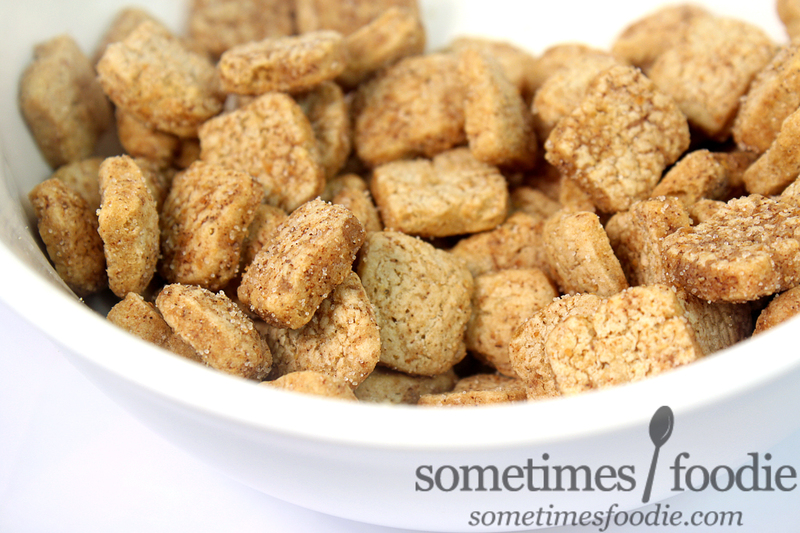 Take away the sugary outside, and all that is left is a slightly crispy cereal that tastes like French Toast Crunch without the syrupy-goodness. The after cereal milk experience is pretty great, it's delicious cinnamon-infused milk with a hint of apple, almost like you're eating overly-thinned out apple cinnamon instant oatmeal, but I wouldn't say the milky pay-off is worth it when you can just eat this stuff dry, right out of the box, and have an amazing snacking experience. 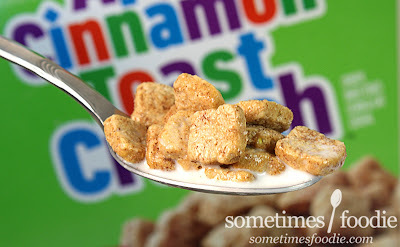 This a wonderful addition to the Cinnamon Toast Crunch family, and it might even replace the original as my favorite dry cinnamon-based snacking cereal. (Which seems oddly specific, but there are a lot of cinnamon contenders out there.) That being said, this is pretty heavy-handed with the apple, so if you don't like apple based cereals (like Apple Jacks) this is not going to be the cereal for you. Me? I love it, and will definitely be buying this one again.